Sign up for our upcoming Webinars! General Training WebinarWith the completely new and up-to-date user interface our users can easily create lists, manage their clients, and search new prospects. Vainu General Training Webinar goes through all of the necessary features and gives you tips to use Vainu as a prospecting tool more efficiently. Vainun yleiskoulutuswebinaari - keskiviikkona 17.4.2019 klo 9.00 (EET). Ei tulossa olevia webinaareja. Katso aikaisemmat myyntiwebinaarit täältä. No upcoming webinars. Watch previous webinar recordings here. Not able to attend the webinars? 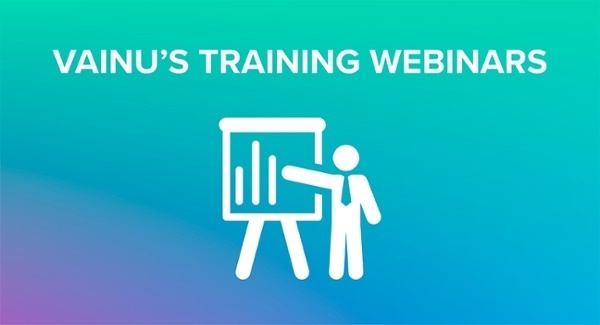 Don't worry, check out the recordings of General Vainu Training Webinars here.